Nearly 2000 to 2500 species of Sri Lankan flora are being used in the Ayurvedic practices in Sri Lanka. Studies on medicinal plants used in ayurvedic or traditional treatment have demonstrated their potential as antimicrobials. Phytochemicals obtained from medicinal plants have been used widely in the development of novel therapeutic agents including antimicrobial agents. The antimicrobial activity of several medicinal herbs used in traditional and ayurvedic medicine in Sri Lanka have been reported. Multidrug resistant microbes pose a major challenge in health care and therefore the demand for alternative antimicrobials are increasing. WHO reports that more than one quarter of Staphylococcus aureus infections are due to methicillin resistant Staphylococcus aureus (MRSA). MRSA is emerging as an important nosocomial pathogen which can cause mild superficial skin infections to severe life threatening systemic infections among hospitalized patients and treatment is difficult due to β-lactam resistance. MRSA is becoming one of the common nosocomial pathogens in Sri Lanka, creating a major challenge for clinicians and a heavy economic burden to the health sector. Candidiasis is the most common fungal infection in the world and may lead to superficial fungal infections or life threatening invasive infections. Recently, antifungal resistance of Candida species has been increasingly reported requiring more potent antifungal agents. Further the undesirable side effects such as hepatotoxicity, nephrotoxicity and neurotoxicity of most of the antibacterial and antifungal agents are important problems which need to be addressed. Therefore, new and potent antimicrobials are essential to face the challenge posed by multidrug resistant microorganisms. In this study, we have investigated the antimicrobial activity of five medicinal plants used in Ayurvedic preparations and decoctions against clinical isolates of MRSA and Candida spp. Among them Berberis ceylanica (Dāruharidrā) and Garcinia zeylanica (Ela Goraka) are endemic plants that merit investigation. Dried stem bark of P. pinnata, dried stem of R. cordifolia Linn, dried stem of B. ceylanica, dried pericarp of G. zeylanica and tender leaves of J. officinale were collected, during the period of January to December 2014 and authenticated by Senior Scientist, Bandaranayaka Memorial Ayurveda Research Institute, Navinna, Maharagama, Sri Lanka. Raw materials were rinsed, dried and aqueous extract was prepared using 60 g of dried plant material (P. pinnata, R. cordifolia, B. ceylanica) and 120 g of fresh plant material (J. officinale) in 1440 ml water. This was boiled under low heat to reduce the volume to 240 ml according to Ayurvedic protocol. The plant extracts were filtered using sterile Whatman No 1 large filter paper. Each filtrate was transferred to a sterile glass container and stored in refrigerator [4°C] up to 2 weeks. Plant materials (60 g from each palnt) were refluxed separately with ethanol (1440 ml) for 4 h, filtered using a Whatman No 1 filter paper and evaporated to get the final volume of 240 ml under reduced pressure at 50o C. Each filtrate was transferred to a sterile glass container and stored at 4o C up to two weeks. Five clinical isolates each of C. albicans, C. parapsilosis and two type strains of Candida species; C. albicans ATCC 10231, C. parapsilosis ATCC 22019, and six clinical isolates of Methicillin Resistant Staphylococcus aureus (MRSA) were obtained from the Department of Microbiology, Faculty of Medical Sciences, University of Sri Jayewardenepura. The methicillin resistant Staphylococcus aureus isolates were confirmed using Antibiotic sensitivity testing following the CLSI standards. Overnight cultures of Candida spp. and MRSA were used to make suspensions (0.5 Mac Farland) and spread on the surface of Mueller Hinton Agar (MHA) plates. Wells were cut using a 9 mm sterile cork borer. The bottom of the wells was sealed by adding a drop of molten agar. Ethanolic plant extracts were dissolved in Dimethyl sulfoxide (DMSO) (Sigma Aldrich) and brought to final (neat) concentration. Then 200μl of the aqueous or ethanolic plant extracts were loaded into the wells using micropipette. Fluconazole and Amphotericin B (0.05 mg/ml) were used as positive controls against Candida strains and Cloxacillin (Karnataka Antibiotics and Pharmaceuticals Limited) and Vancomycin (Karnataka Antibiotics and Pharmaceuticals Limited) (30 mg/ml) of IV antibacterial preparations were used as positive control against MRSA strains. The inhibitory zone of microbial growth around the well was called as the zone of inhibition (ZOI), this was calculated by subtracting the measured diameter of the ZOI from the well diameter in aqeous extracts, and for the ethanolic extracts the ZOI was obtained by subtracting the diameter of ZOI from the DMSO control well ZOI. In the well diffusion assay any zone of inhibition observed was considered as significant. We included a cloxacillin containing well which shows no zone of inhibition as a negative control. Well diffusion assay was done in triplicates for each individual isolate and average zone of inhibition was calculated. Minimum Inhibitory Concentration (MIC) was determined using the pour plate method as described previously. Both aqueous and ethanolic extracts were prepared using 60 g of dried plant material and 120 g of fresh plant material boiled down from 1440 ml to 240 ml. Briefly, doubling dilutions of extracts (Neat, 1/2, 1/4, 1/8, 1/16, 1/32, 1/64) were prepared in MHA using the aqueous extracts and ethanolic extracts. Molten MHA (20 ml) was cooled to 50o C, mixed well with each extract dilution and poured into sterile petri plates. The plates were allowed to dry and a grid containing 12 squares were drawn on the back of the glass plate. Five microliters of each organism suspension (prepared to the 0.5 Mac Farland standard) were placed on the surface of the agar plate in each grid. The drop was allowed to stand for few minutes and the plate was incubated in the upright position at 37o C. Presence or absence of any growth of the organism was observed after 24 hours. The lowest concentration of the extract that inhibited the visible growth of a microorganism after overnight incubation was determined as MIC. Experiment was done in triplicates and the average MIC was calculated. The aqueous extracts (250 mg/ml) of B. ceylanica, inhibited the clinical isolates of C. albicans (ZOI = 4.5 mm), while in the ethanolic extracts, both C. albicans ATCC 10231 (ZOI = 14 mm) and the C. albicans clinical isolates (ZOI = 15.8 mm) showed inhibition. Aqueous extract of B. ceylanica had a ZOI of 3 mm against Candida parapsilosis ATCC 22019 while a larger ZOI (13.7 mm) was obtained for the ethanolic extracts against the type strain and clinical isolates of C. parapsilosis [Table 1]. 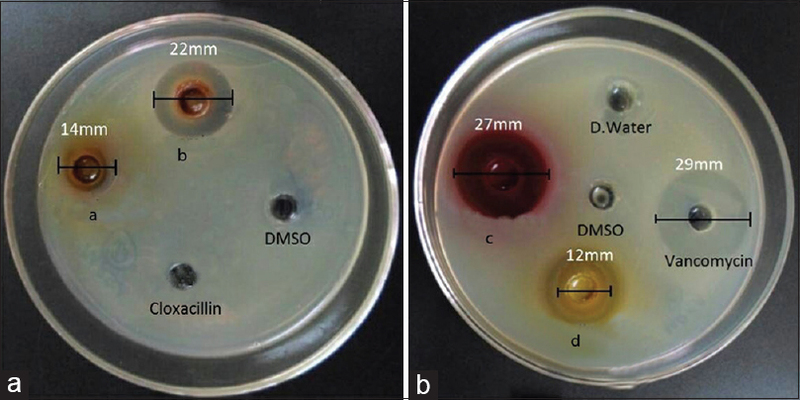 Aqueous extract of G. zeylanica exhibited antibacterial activity against MRSA with a ZOI of 4 mm. Dried stem of R. cordifolia gave a ZOI for two of the isolates but was resistant to the others. Zones of inhibition was observed with the ethanolic extracts of P. pinnata (4 mm), R.cordifolia (10.7 mm), J. officinale (4.6 mm) and G. zeylanica (14.2 mm) against MRSA [Table 1]. The results of the well diffusion assay showed sensitivity of C. albicans against aqueous extracts of B. ceylanica and the ethanolic extract of R. cordifolia while the MRSA strains were inhibited by aqueous and ethanolic extracts of G. zeylanica, ethanolic extracts of P. pinnata and J. Officinale [Figure 1]. Therefore, these extracts were further tested to determine their minimum inhibitory concentration against the isolates. The MIC of aqueous extract of B. ceylanica against C. albicans and MIC of aqueous extract of G. zeylanica againstMRSA wasat neat concentration. Both extracts were prepared according to the standard method described in Ayurvedic texts. The ethanolic extracts had a MIC of 1/8 dilution for R. cordifolia against C. albicans, while the MICs of ethanolic extracts of P. pinnata, J. officinale and G. zeylanica against MRSA was at the dilutions of 1/8, 1/16 and 1/16 respectively. In this study, G. zeylanica exhibited an antibacterial activity against methicillin resistant Staphylococcus aureus (MRSA). This is the first study to our knowledge which has investigated the antimicrobial activity of this plant. The pericarp of G. zeylanica is used as a spice in Sri Lanka. It is an endemic plant with no reported studies on its antimicrobial activity. MRSA is increasingly responsible for causing nosocomial infections, particularly in critically ill patients. Methicillin resistant Staphylococcus aureus show resistance to all β-lactam antibiotics, and is often resistant to antibiotics such as macrolides and aminoglycosides, thus being multi drug resistant. According to a study conducted in Sri Lanka, MRSA was isolated from 12.9% patients on admission to a surgical unit in National Hospital, Sri Lanka, while 6% were nosocomially infected during the hospital stay. It is also important to note that G.gummi-gutta which belong to the same genus Garciniahas antibacterial activity against S. aureus. Garcinia gummi-gutta is used for treatment of skin related diseases in Ayurvedic medicines in Sri Lanka. Aqueous extracts of B. ceylanica, had exhibited an inhibitory activity against isolates of C. albicans. Candida albicans have been reported to be a major pathogen responsible for human Candidiosis. However, recently non-albicans Candida species such as Candida parapsilosis, Candida glabrata, Candida tropicalis and Candida dubliniesis have been frequently identified as both pathogens and commensals. Further the incidence of C. parapsilosis infections has increased in the past few decades and is reported as the second most frequently isolated Candida spp from blood cultures. Prophylactic and empirical use of antibiotics and antifungals are an important factor contributing to the development of antimicrobial resistance among these pathogens. In Sri Lanka B. ceylanica is used in Ayurveda medicine to treat variety of infections. However, no studies have been reported on the antimicrobial activity of B. ceylanica against these two pathogens to the best of our knowledge. In Ayurveda, B. aristata is used to treat trachoma, skin diseases and diarrhea in India. Therapeutic properties of B. ceylanica are very rarely validated except the effects of Vipadikahara Grita Taila in which B. ceylanica is a major ingredient. The physico-chemical parameters, phytochemicals and some of the therapeutic properties are similar among both B. aristata and B. ceylanica. In general, plants which have antimicrobioal properties exhibit wound healing properties. Similarly, J. officinale, P. pinnata and R. cordifolia have shown wound healing properties in animal models. Antimicrobial activity of two endemic plants G. zeylanica and B.ceylanica against MRSA and two Candida spp is reported for the first time in Sri Lanka. It is therefore important to investigate the potential of these plants as novel antimicrobial agents, targeting the multidrug resistant bacteria and fungi of clinical importance. We acknowledge the kind assistance by Prof. G.J. Panagoda, Department of Oral Medicine and Periodontology, Dental Faculty, University of Peradeniya for his contribution. Ravishankar B, Shukla VJ. Indian systems of medicine: A brief profile. Afr J Tradit Complement Altern Med 2007;4:319-37. Gomes P, Hewageegana S, Kottahachchi J, Athukorala G, Weerasekera M, Gunasekera T, et al. In vitro study to determine antimicrobial activity of selected ayurvedic preparations against bacteria and fungi causing superficial skin infections. Sri Lankan J Infect Dis 2013;3:32-9.
WHO. Antimicrobial Resistance: Global Report on Sruveillance 2014. Switzerland: World Health Organisation; 2014. Song JH, Hsueh PR, Chung DR, Ko KS, Kang CI, Peck KR, et al. Spread of methicillin-resistant Staphylococcus aureus between the community and the hospitals in Asian countries: An ANSORP study. J Antimicrob Chemother 2011;66:1061-9. Gangadhara P. Uttara Kandha. In: Sharangadhara Samhita. Bombay: Pandurang Jawaji; 1920. Abayasekara CL, Rangama BNLD, Panagoda GJ, Senanayake MRDM. Antimicrobial activity of Tephrosia purpurea (Linn.) Pers. and Mimusops elengi (Linn.) against some clinical bacterial isolates. J Natl Sci Found Sri Lanka 2009:37:139-45. Tosti R, Samuelsen BT, Bender S, Fowler JR, Gaughan J, Schaffer AA, et al. Emerging multidrug resistance of methicillin-resistant Staphylococcus aureus in hand infections. J Bone Joint Surg Am 2014;96:1535-40. Corea E, de Silva T, Perera J. Methicillin-resistant Staphylococcus aureus: Prevalence, incidence and risk factors associated with colonization in Sri Lanka. J Hosp Infect 2003;55:145-8. Hewageegana HG, Arawwawala LDAM, Dhammaratana I, Ariyawansa HA, Tissera MH. Development of a substitute oil for vipadikahara grita taila and it's evaluation against vipadika skin disease (A case study). Am J Clin Exp Med 2015;3:306-9. Hewageegana HG. A Study of Skin Diseases: Ksudra Kustha Depicted in Sanskrit Original Sources with Special Reference to Vipadika and its Management. Ph.D. Thesis. University of Kelaniya; 2015. Shekhar S, Prasad MP. Evaluation of antimicrobial activity of Jasminum species using solvent extracts against clinical pathogens. World J Pharm Pharm Sci 2015;4:1247-56. Bhandirge SK, Tripathi AS, Bhandirge RK, Chinchmalatpure TP, Desai HG, Chandewar AV, et al. Evaluation of wound healing activity of ethanolic extract of pongamia pinnata bark. Drug Res (Stuttg) 2015;65:296-9. Karodi R, Jadhav M, Rub R, Bafna A. Evaluation of the wound healing activity of a crude extract of Rubia cordifolia L. (Indian Madder) in mice. Int J Appl Res Nat Prod 2009;2:12-8.